In the Kingdom of Heaven film [and I freely acknowledge that there are problems with authenticity with it] Godfrey demonstrates to his son Balian the "Guard of the Hawk" posture for sword fighting; la poste del falcone. Is there any basis in fact that this was an actual fight posture / stance? 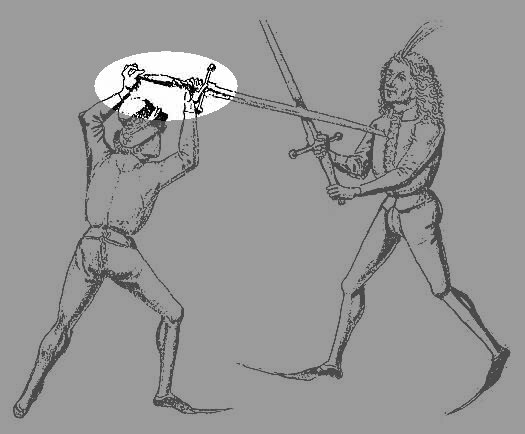 To the untrained eye [ie mine - I neither own or have ever used a sword] it seems to be a valid technique for using a hand and half sword. I look forward to hearing from sword users and sword technique afficiandos, even if it is to be told how wrong I am! Can't be 100% sure, but I believe Vadi has a technique called "posta di falcone". I'll try to check it, unless anyone can confirm it. I just don't have access to my books right now. Good question, Malcolm. I believe it was and that's what the Italians called it: posta de falcone. To the English, this stance was known as the haukse bill. The German schools of fence actually had two terms for it: vom Dach (from the roof) or Oberhut (upper guard). It's actually become one of my favorite stances, partially from the element of deception; my legs and torso are greatly exposed. I'm quite vulnerable, right? Well, an incoming thrust -- I can forcefully bring down my sword to counter it, or simply take a step backward. Having your legs correctly positioned will allow you to sidestep effectively should your opponent strike at you from the right or left. Likewise, if I make the first move, it will be a forceful downward cut that my opponent would be wise to not be on the receiving end of! Even if I miss, I can easily recover and sneak in a strong upward thrust or a rising cut. I hope this helps. This stance can certainly prove to be a useful one with the proper training and study. Really, a posta di falcone, or whatever you call it, is quite similar to Fiore dei Liberis posta di donna. Of course depending on how you enterpret the posta di donna, but I usually use it by holding the sword tip down behind my head, with the crossguard above my head. Or, in some cases with the crossguard resting on my right shoulder, or with the blade running parallell to my shoulders, while turning my left hip towards the enemy. It really depends on the intended use nd follow-up technique. I guess holding it in a way similar to the posta di falcone would also work in a similar way. But of course, you may disagree . Many thanks for the inputs to date! I found a link to Vadi's manuscript which did indeed list the position, albeit without much description. Many thanks once again; what a great site this is! At our Albion sword party Todd demonstrated exactly this from (i'm gonna screw up the spelling) Lechtinheure. I saw Kingdom Of Heaven the next weekend so it stuck in my head when they did that . 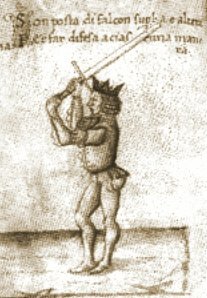 Posta di falcon is indeed a stance in the medieval Italian tradition of longsword. It is named in Vadi's manuscript, De Arte Gladiatoria Dimicandi (the shortened name), as Johan mentioned. I only finally saw Kingdom of Heaven this past weekend, and the guard is more or less as they depict it. It's doesn't have the same name in the Liechtenauer tradition, it would be vom tag or tag ("from the roof", or the "roof" guard), but it definately is seen in both schools. Per far defesa a ciascuna maniera. "I am the falcon's stance, with the blade upright to achieve defense in every way." Good point. You certainly wouldn't have seen sword designs or techniques like that during the 12th century. 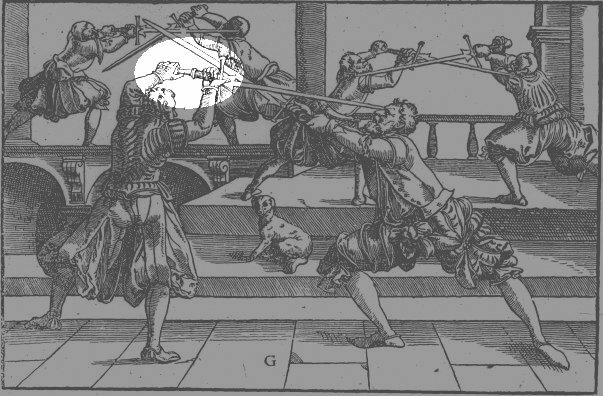 The figure in the illustration seems to be gripping the pommel; is this correct? That was a common method of gripping a sword. It wasn't always done, but certainly many preferred to do so. As others have stated, the posta is one of Vadi's. In addition, the line about low guards not being able to withstand attacks from above is either a direct quote or a close paraphrase of Vadi. The bizarre thing is that Vadi then goes on to show you how to defend from low guards against attacks from above without directly withstanding the force of the blow. IIRC the guard that Bloom took would actually have been quite good against the Posta di Falcone. It does show that people out there in Hollywood are reading this stuff. Unless they read medieval Italian, they would have got this from the Porzio/Mele translation of Vadi released by Chivalry Bookshelf. It's a step in the right direction. unless Ive missed it somewhere above there is a little problem here. Granted its a HUGE step that they are actually using things that exist- or are at least aware of them. But the Crusades are way too early for this - Vadi is still a long way off from this point. Granted it has to start somewhere but I dont think it fits in with the time period of the film. But yes it is a nice step. Quite right - I believe the evidence of deliberate planned two-handed use of a sword is well into the next century after the Battle of Hattin, so the use of the posture and terminology is pure speculation. Still, I am very pleased that someone actually looked at real medieval source, even a couple hundred years from the desired period. Since there is no surviving period literature (i.e. the will o' the wisp sword + shield manual), they got reasonably close. After all, we don't no that the posta di falcone wasn't invented, nor do we know what it might have been called. So, I appreciate their effort, even if it is pure speculation - which is a lot better than being out and out wrong (which is what usually happens). Maybe someday Hollywood will ask one or some of the experts to help do these movies, people like Stephen Hand, Christian Henry Tobler, John Clements, Guy Windsor and their colleagues, so we can see some real authenticity. In my opinion Hollywood could really use these experts! Great swords were known to exist in the late Viking Age (see the Lepaaho finds). So the use of swords of that size in that era was probable, though admittedly probably not to the degree that Hollywood portrays. As for the terminology, I can't argue with you there. We all wish that, but research and accuracy are expensive, time consuming, and may not sell as well as the "flash and trash" they bombard us with. Watch the movies they put out for entertainment value; that's what their intent is. Expecting accuracy out of Hollywood is like expecting groundbreaking new physics concepts from a trout. Yes Chad isn't that the truth, Hollywood get something predominantly correct in history? I may never live to see that happen. Even I know as a beginner that you don't go around slamming your sword edge into another sword, or that swords do not cut chains. Geesh, yes it drives me nuts watching these ridiculous stunts in movies. Which is why I said I wish Hollywood would hire these profound sword experts, forgive me here but I am trying to think of the other gentleman's name who was thinking of doing a 3rd sword instruction dvd in another thread, I had meant to list him too with the other 4 experts that I had named. Being relatively new, there are a lot of experts I do not know of, so to these other sword and medieval arms experts I did not name please forgive my lack to have listed you, as I am pretty new, believe me, you are included! I wish Hollywood would call upon each and everyone of you, pay you some big bucks to get us some sword movies that have reality in them. But as Chad said, this is like waiting for a solution in physics by a trout! Wow that was funny, thank god I had swallowed my coffee before I read that, I'd of spit it all over my monitor otherwise!